Spanish cuisine might be better-known for its tapas, grilled prawns and paella, but the nation also has a strong tradition of tasty, refreshing or hearty soups. They make an excellent starter choice for your next Spanish-themed dinner party. Cocido is Madrid’s signature dish. Cuts of meat, chorizo and vegetables are cooked slowly in a broth flavoured with the smoked paprika known as pimenton. The liquid is then served in a highly-flavoured soup, occasionally bulked out with tiny pasta. 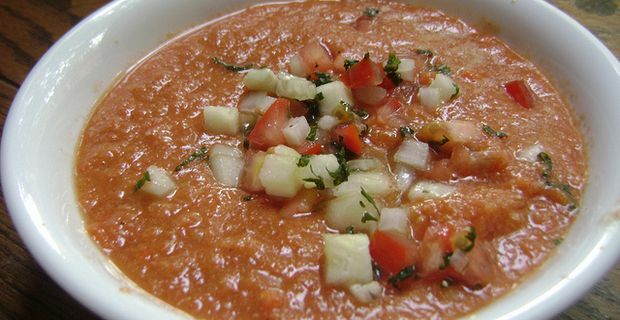 Gazpacho is the famous Andalucian cold soup of blended cucumber, tomato, garlic and stock. Recipes vary across the region and often softened bread is used to thicken the gazpacho. A variant is ajo blanco, an almond and garlic soup that is influenced by Moorish dishes and is perfect for the hot summers of inland Andalucia. Marmitako is a rich tuna soup that is eaten all along the northern coast of Spain. It has Basque origins but neighbouring Cantabria and Asturias have given the dish their own variations. The basis is white tuna, or bonito, with potatoes and green peppers in a saffron-tinged broth. The Cazuela de Marinera, or fish stew, has variations around the Spanish coast, but revolves around firm white fish and shellfish, usually mussels and clams, cooked in a rich, tomato-based stock, with white wine. It is a Spanish relation of the French bouillabaisse. Caldo Gallego is a hearty stew made in the rural regions of Galicia in the north-west. The basis of the soup is potatoes and grelos, the green leaves of turnips, although it is often made with cabbage. The stock is flavoured with ham or a pork knuckle. The addition of white beans is optional.